"Whisper Pines Lodge" is a fantastic property that has it all. Fall asleep to the relaxing sounds of the stream in this stream side cabin. Awaken to the gentle breezes rustling through the trees as you get ready for a day of excellent trout fishing, horseback riding, golfing, hiking, whitewater rafting, cave exploration, downhill skiing, ASU football, or shopping and antiquing in Boone or Blowing Rock. 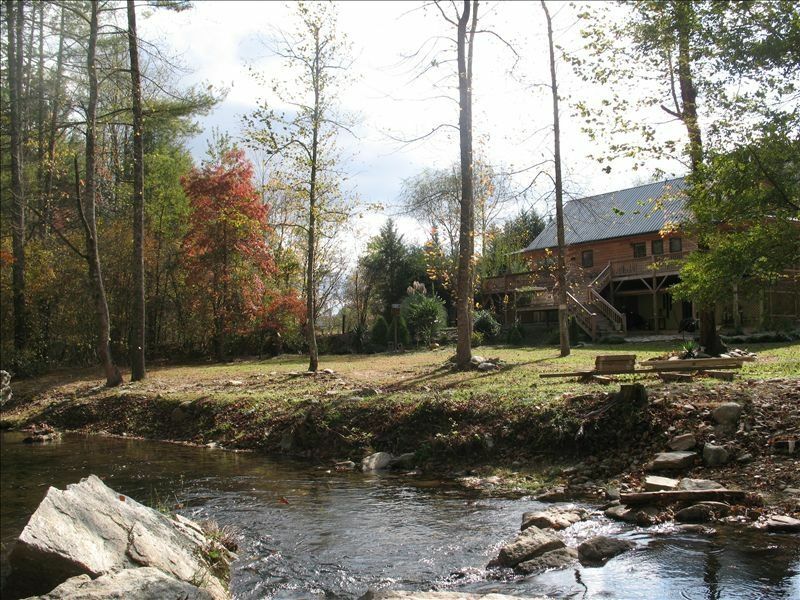 This one of a kind property offers a large retreat cabin that is situated on five beautiful acres with a rushing stocked trout stream. The cabin is nestled between two mountain ridges and have Laurel Creek and Elk Creek merge together at the beginning of the property and flow throughout the entire five acres. The property is beautifully landscaped with rock outcroppings, rock gardens, majestic trees, and flowering plants. This cabin comfortably sleeps 10 and there are two additional cabins available on the property which can rented with the main cabin(please contact for pricing) to sleep a total of 16, or the additional cabins can be rented separately which makes this property ideal for anything from a romantic couples weekend to a family reunion, large family, or multi family vacation. The main cabin, Whisper Pines Lodge, has two separate and complete living areas. The main floor has two bedrooms-one in LOFT area, one on main floor, large living area with cathedral ceilings, full kitchen, two baths, gas fireplace, and outside porches that wrap around the entire cabin and overlooks the mountains and trout stream. The lower level has two more bedrooms, another full kitchen, full bath, living area, and laundry facilities and offers full privacy. Both levels are fully furnished with all the comforts of home and are tastefully decorated with local antiques in an upscale country decor. This cabin sleeps ten and rents for $225 per night or $1495 per week. New additions to this cabin also include a private, top of the line 6 person Jacuzzi hot tub that overlooks the stream, and a pool table for your nighttime entertainment. Be sure to bring your fishing poles as you can walk out the back door and catch trout, small mouth bass, and sunfish for dinner or just for sport. Elk Creek is a state stocked trout stream, and it is rated as one of the cleanest in all of NC. Fishing is excellent right on the property with several very nice trout holes with both native and state stocked trout. Other amenities include gas grills at each cabin, fire pit for bonfires and marshmallow roasts, and plenty of rocking chairs, swings, and hammocks on the property for just plain relaxing. This cabin retreat is also conveniently located to all the area activities and attractions. Enjoy horseback riding just minutes away at nationally known Leatherwood Stables which is adjacent to this property and offers trail riding from beginning to expert year around. There is excellent dining, shopping, and antiquing in Boone (20 minutes) or Blowing Rock (30 minutes). If you are looking for a stream side cabin for your mountain retreat you will not find a better location anywhere. This property has it all to make your trip to the mountains memorable. We really enjoyed our time here with family!! Plenty of room for all of us. Very nice place. Beautiful views. The property was very secluded. You are about 25 minutes from anything so plan ahead. It looked just like the pictures. Portions of the road in both directions are gravel and are typical mountains roads (curvy). The house number is not correct on the info I received. It is off my 2 numbers. Look for the sign "Whispering Pines" at the driveway entrance. It is a nice home, but really needed a bit of TLC. The bushes and trees need trimming away from the house which may help with the bugs. We were inundated by stink bugs. They were everywhere. As a beach property owner, I understand insects are "expected", but this was a bit much. The kitchen was pretty well stocked and I was surprised to find paper products, hand soaps, and even detergents there. We brought our own since most rentals don't provide these. The only thing that really needs to be added to the kitchen is a can opener. I read in one of the other reviews that someone bought one and left it. It is a very inexpensive opener and we struggled to get it to work. The water had a horrible sulfur odor. I read online that this can be harmful if the levels are too high, so we only used it to bathe. We used bottled water for everything else. There needs to be a filter added to the house or the well needs to be treated. We didn't catch any fish or really see any, but we were entertained by a family of beavers that hung out by the base of the rocks in the bend of the creek. We tried to get wood delivered but the voicemail box of the number given was full. We never could reach the person, so we purchased a small amount in town. The fire pit was deep and sits right near the water. It was really peaceful. We really had a nice time despite the few flaws. The owner was very flexible with us (I asked to move our dates last minute). Thanks for sharing your home. It was a very peaceful refuge. We enjoyed having the creek in the backyard. I am not one who usually complains however when we arrived the refrigerator on the main level was not working. When we called the owner to inform him he said he was aware and that there was another refrigerator delivered downstairs and it had not been set-up and he could not get there before Monday to move it upstairs, which was the day we were leaving. There was another refrigerator downstairs that was working and he said well can you just use that one, we said yes, it is not like we had a choice, which was a huge inconvenience for my family since my husband has a bad back and has had 5 back surgeries and it was hard on him having to go up and down stairs every time he needed to get something from the refrigerator. The bathroom downstairs, the toilet seat was only bolted down on one side so the seat was turned around sideways. The bed upstairs on the loft was worn out and sunk down in the middle so when we went to bed we were laying on an incline towards the middle. We read several reviews after our trip and found one dating back to 2012 that complained about the same bed doing the same thing. So it is obvious that the owner does not care about fixing problems around the house. The grass had not been cut and it was tall. If I were an owner of rental properties I would make sure everything was right for my guests so that they would want to come back and they would want to refer friends and or family. The house definately needs some grooming, especially for the money we paid to stay in this house. It is a very nice house for it to be in this shape. Sorry for the long review but felt it all needed to be addressed. It is always my intention to provide a great vacation rental experience for each guest. You will see most of our reviews are 4 and 5 star reviews, however, there are sometimes circumstances that arise. I had a new refrigerator delivered from Lowes just prior to this guest's arrival, but they were unable to install it upstairs at that time and had to return at a later date. That was very unfortunate and out of my control. Although it was inconvenient there was a second refrigerator downstairs available for the guest to use. The guest's complaint about the upstairs mattress is the first that I have heard. Her statement that it was the same mattress that was mentioned in a previous review in 2012 is simply untrue. That was a downstairs mattress and that one has been replaced. I will also make arrangements to replace the upstairs mattress if needed. I am very sorry that these issues had a negative impact on their stay. I did offer a sincere apology and a one night refund for the inconvenience. We honestly could not have asked for a better place to stay! It was so quiet and peaceful. We were already talking about booking another stay before we even left! Just be sure to bring everything you may possibly need as its quite a trip to the store. We were fine with that, since we had wanted something in the middle of nowhere. Honestly can not wait to go back! Great place to relax and get away! We went on a short mountain getaway with friends, 4 adults and 5 children. We had a wonderful time enjoying the cooler temperatures and beautiful landscape! The stream was the highlight for all. We did venture out into the Boone area for tubing but we all agreed that you could really just spend your days on the property. The house was great for our group. Two laundry rooms are essential. We enjoyed the open living room and kitchen and the wrap around porch was great for all! We put all the children downstairs which was great for us adults. The hot tub would not heat up the first night and Bill sent a repair person that evening. It was all handled very quickly and we really appreciated that! The house could use a deep cleaning. There was quite a bit of dust and cobwebs. The kitchen and bathrooms were very clean though. I noticed quite a bit of trash in the foliage around the house, trash in the bushes and cigarette butts. Overall this was an excellent home to vacation in and we hope to return again! Holidays and summer may require longer stay Weekly rate $1495 plus tax and cleaning fee Cancellation 60 day prior to arrival for deposit refund.